A city of wide and beautiful boulevards, monumental buildings, rich architecture, narrow cobbled streets and numerous spas. Budapest lies on the Danube River, crowded with boats and full of cafes, bars, and restaurants on its shore. This stunning city lure tourists from all over the world to visit Hungary. And its picturesque cityscape makes the perfect location for photography lovers. We have listed the best places for Instagram photos in Budapest that will make you fall in love with this unique and cool city. On our travel guide to 3 Days in Budapest, what to do and hidden gems, you can find travel tips to plan your next holiday to Hungary’s capital and suggestions for hotels in Budapest. Now it’s time to share our best Instagram photos in Budapest, snaps that will inspire you to travel there soon. Budapest is gorgeous, and everywhere you look will find opulent architecture, art and perfect places for urban photography. These are just a few beautiful places you should visit in Budapest. The city has many attraction, tons of things to do in Budapest that will keep you busy for days. Once you are there, follow our tips to the most Instagrammable places in Budapest and also venture yourself through the less touristy areas, so you can really discover the beauty of Budapest. The building of the Hungarian Parliament is certainly one of the most famous tourist attraction in Budapest and also one of the most photographed places in the city. The enormous edifice is the third largest parliament in the world and second largest in Europe. If you want to know more of this historical and architectural gem of Hungary, book a tour to enjoy it from outside and inside. There will be a lot of spots where you can take some quality photos and capture that perfect moment for your Instagram photos in Budapest. Our photo advice: The Hungarian Parliament is huge, when visiting it you can snap good detail photos from inside and outside. To get the whole building on your photo you will need to go away from it. The best spot to take a photo of the Parliament building is from Buda side, or from Margaret Bridge. By the shore of Danube River, before you arrive at Margaret Bridge, there is a place you can stop and take the best photos of Budapest Parliament. That’s a beautiful sunset! Where is your favorite spot to catch a sunset in Budapest? . . #Budapest #winterbudapest #GoToHungary #thisisbudapest #insta_budapest #watchthisinstagood #roamtheplanet #ig_worldphoto #theglobewanderer #travelblogger #vacationwolf #wonderful_places #ig_photostars #viajar #awesomepix #worldtravelpics #beautifulplaces #wonderfulplaces #rbbviagem #canonbringit #sunset #sunsetpic #followyourheart #hungary?? Danube is a majestic river that flows through several countries, like almost no other in the world. Budapest had the luck to be founded on one of the most beautiful parts of Danube and it can brag with its luscious nature, green shores and wide waterways. Enjoy a relaxing cruise down the fantastic river and take photos of Budapest and its famous attractions from a whole new perspective. Our photo advice: From the Liberty Bridge, Chain Bridge and Margaret Bridge you can capture the beauty of Danube River and also some of Budapest top attractions on its shore. Those are the perfect spots to work a nice photo composition. The Fisherman’s Bastion aka Halaszbastya was built between 1895 and 1902. Its architecture is a mix neo-Gothic and neo-Romanesque. . . #Budapest #winterbudapest #GoToHungary #thisisbudapest #insta_budapest #watchthisinstagood #roamtheplanet #ig_worldphoto #theglobewanderer #travelblogger #vacationwolf #wonderful_places #ig_photostars #viajar #awesomepix #worldtravelpics #beautifulplaces #wonderfulplaces #rbbviagem #canonbringit #girlsborntotravel #sheisnotlost #followyourheart #hungary?? This interesting name comes from the fisherman’s market, which was present here during the medieval period and the entire surrounding area was named Fisherman’s Town. The building itself seems fairytale-like, unreal and playful, perfect for an Instagram shot. Also it fits perfectly with the ambiance, making a harmonious whole with St. Matthias church. Despite the “bastion” part of the name, it was actually never used in defense purposes, but was built only as a place for enjoyment that gives you an amazing view of the city. Another great attraction and one of the best places for photo in Budapest is the Buda Castle. At the Castle district in Budapest, you can take amazing photos of the old buildings with extraordinary views of the cityscape and the Danube River. The Liberty Bridge is one of the nine beautiful bridges in Budapest. It was built back in 1896 for the Millennium World Exhibition. The official name of the bridge is Francis Joseph Bridge, but the name it is famous for was taken after its destruction in the WWII when it became the first bridge in the city to be rebuilt and re-opened for transportation. Another great thing is that nearby you can find several valuable attractions, like the Gellert Hill [that provides an incredible view at the city], Center Market Hall, Statue of Liberty and many, many more. Our photo advice: All the Danube bridges are perfect spots for photography in Budapest. The Liberty Bridge is not the most famous one, but it’s our favorite. Especially to take long exposure shots. In front of the bridge, there is a tram station, where you can put your camera tripod and work on some good night shots [here you can find our suggestions for good travel tripods]. The Vajdahunyad Castle is one of the most romantic and architecturally interesting places in Budapest, perfect for photos. Built in the 1896, it represents a complex of architectural styles from the medieval period till the 18th century. Here you can enjoy numerous concerts and festivals throughout the year, as well as the exhibits of the Hungarian Agricultural Museum. It is a truly scenic place with lots of motifs for amazing photos. 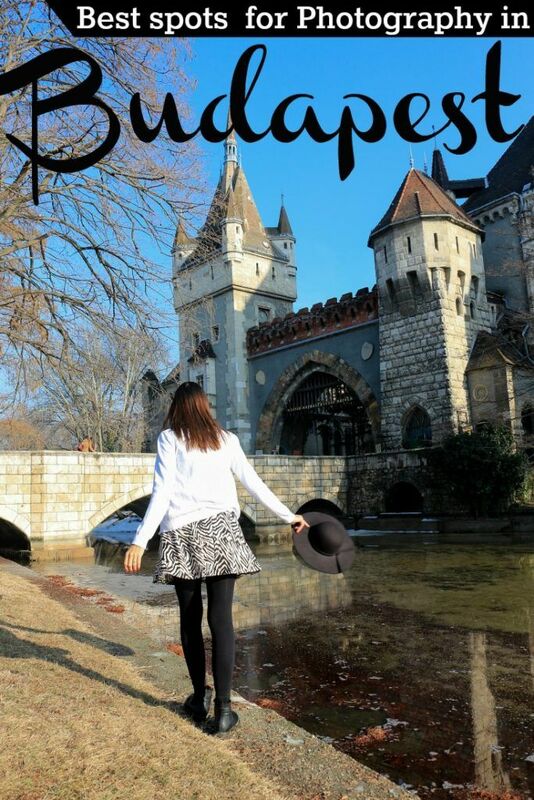 Our photo advice: The Vajdahunyad Castle is one of Budapest top attractions and it will be full of tourist most of the time. If you can’t get a clear shot from the castle gate, move your point of shooting, maybe go to the side of the building or at the lake under the entrance bridge. The castle is very beautiful, it’s one of the best places for photography in Budapest. Budapest is known for its numerous spas and baths, and one of the most popular and largest of them is the Szechenyi Thermal Bath. An incredible complex that offers hot springs, outdoor pools, saunas, spa treatments, massages and more. The spa tourism became very popular and all thanks to Turkish occupiers from the 16th century that brought their tradition here. Its location is ideal; it lies in the green oasis of the city, but at the same time you are near all the other top attractions of Budapest. The Szechenyi Thermal Bath is a good motif for photos em Budapest, the exterior and interior are beautiful. From the outside it looks more like a palace than a public bath. Our photo advice: It’s allowed to take photos in the pools and saunas, but remember it’s a public place so not everybody feels comfortable with someone taking photos of them in a relaxing moment. The bath is perfect for architecture shot and photos inside the pools. For water photography you will need a proper gear. We took this Instagram photo in Budapest with our GoPro Hero4, the camera we use for actions and underwater shooting. Or a waterproof case for your mobile phone it’s also a good idea. This is probably one of the most iconic symbols of Budapest, as well as the first permanent bridge built between the two sides of the city. In fact, those two parts of Budapest as we know it today were connected only by a floating bridge. It is especially charming at night when the lights illuminate the entire bridge and Danube turns into a grandiose mirror. You can see the reflection of one of the most beautiful bridges in Europe. Once you cross the Chain Bridge to Buda side, on a square below the tunnel, you will find an oval stone marking the “zero kilometer” – a place from where every distance in Budapest are measured in Hungary. It is a very interesting and unique attraction. Our photo advice: Tons of people are crossing and taking photos of the Chain bridge during daytime. If you want to snap great Instagram photos of Budapest iconic bridge you need to think of different angles and go there during different times of the day. At night the place gets quiet and the lights illuminating the bridge are stunning. The “era of cafes” was at its peak between 1910 and 1930, when you could find more than 500 cafes all over the city. It was a favorite sitting and meeting place for writers and artists of the time, but it was also popular among the ordinary people. Sunday afternoons were reserved for a nice cup of coffee and good company. Sadly, during the wars, many of those great classic cafes were destroyed. And the communist regime that followed wasn’t either thrilled with the idea of cafes being the top meeting spots. However, today you can find some renovated and rebuilt cafes that have preserved the touch of the beginning of the last century, treasuring the past and cherishing some long gone times. They make a perfect location for your photo session, while enjoying a cup of coffee and a delicious cake. Our photo advice: One of the most famous and most photographed cafes in Budapest is the New York Cafe at the Boscolo Hotel. It’s one of the most beautiful cafes in Budapest and its perfect for photography. However, it’s always packed with tourist and it’s quite expensive. My photo advice is to look for small cafes, hidden gems in Budapest as the Uránia Film Theater and Cafe. 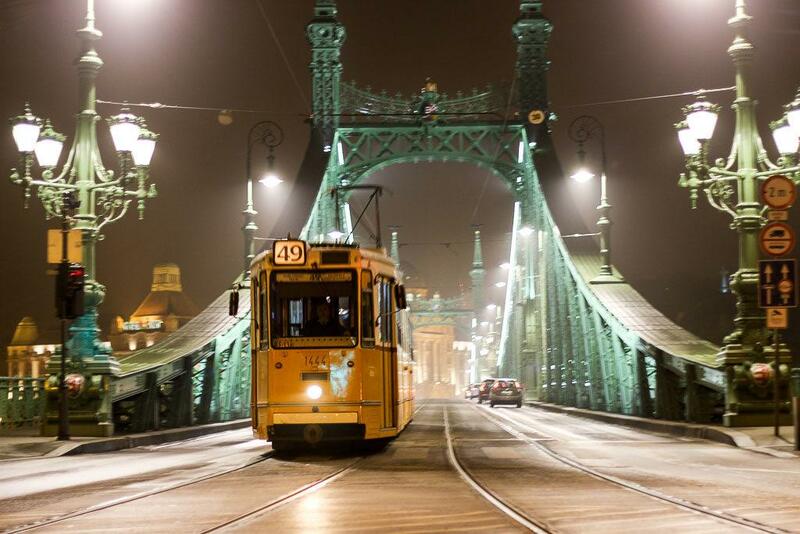 If you want to take a trip to the past and taste the old way of living and transportation, the time when trams were an innovation, take a tour of historical tram lines in Budapest. You will be able to see many interesting places in and around the city, while driving down one of the most beautiful tram lines in the world. Whether you are a tram enthusiast or not, this will be an amazing and unique experience, you will be completely enchanted with it. If you like urban photography or local life shots, follow the tram lines, it will give to you amazing photo opportunities. Our photo advice: The streets of the Pest side are busy and there are several tram lines crossing the city, making it the perfect place for photos of bustling Budapest. You can also plan your photoshooting by the river, there is a tram line that runs on the shores of Danube. Our tram Instagram photo in Budapest was taken at the Buda side, where the streets are quieter and we can focus only on the beautiful and old trams. Budapest is the perfect city for photography. Not only the famous attractions are great spots for Instagram shots, the neighborhoods, the street art and the decay building also gives you great photo opportunities. work on your photography skills while exploring this stunning European capital. Be inspired by our suggestion of the most Instagrammable places in Budapest and don’t forget to read our guide to things to do in Budapest, attractions and hidden gems. Have a wonderful trip and great photos! Love this post? Pin it for later!! The Parliament is incredible Natalie. One of the world’s iconic shots. Awesome photos! I feel like I traveled to Budapest through your post. Wow … now I’m super excited to visit Budapest later this fall … excellent Insta snaps! Tks Tina! Budapest is an incredible city for photos!